According to the research, just standing up for three hours a day, makes you burn 150 kcalories. Human being is not designed to stay on a chair. That’s why the very direct suggestion is to spend sometimes working standing up. You think is crazy? Google, Intel and Apple don’t think so: they just ordered massive quantities of high desk, to let employee work standing up. Not to mention meetings: the above companies spend more of their time during meetings standing up or even walking ! The real issue here is that 2 hours gym a day doesn’t represent any remedy at all. It may solve the aestethic problem (going to gym lets you lose some weight), but doesn’t fix the metabolsm iseue: when sit, our body cannot produce the ensymes necessary to the correct transformation of the bad cholesterol into the good one. 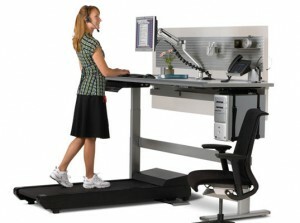 The solution: just spend 2 minutes walking every 20 minutes spent sit at a desk. 2. Spend yuor time during the meetings, standing up. Share your thoughts and leave a comment!